Home / babies / babycleaning / care / Mother Sparsh Wipes – As Soft as Mother’s Touch / MotherSparsh / Parenting / Protect / skin / waterwipes / Your baby can also be rash free. Before their baby arrives, every parent has to make a list of essentials which are required for their little child. The "New Baby Must -Haves" list contains items like bottles, onesies and diapers. Looking at this list, we cannot forget baby wipes along with diapers. My family is a new age nuclear family where the three of us live - Mother, Father and Little Angel. So my baby was initially raised by us without any help from our family or relatives, her entire responsibility was on me only mostly as her daddy used to work long hours at office. With her arrival, my responsibilities have increased a lot taking care of the home, myself and my baby. So I am trying to cope up with everything new as my body is recovering post-delivery. I was becoming a mom for the first time and was truly overwhelmed and I wanted to give my best and put all efforts for my little one. New born children are an epitome of purity & cuteness. They are sensitive and fragile. Utmost care is taken to protect them from germs or anything that can harm them. This delicate skin is very vital for her as it lets her sense and learn about the world around her, lets you as a mother communicate with her through touch and also protects her from the environment. That’s why it’s important to keep your baby’s skin protected and healthy. The infant has to be cleaned every few minutes sometimes 15 to 20 times a day. That's very tedious and time consuming for my little one’s schedule. 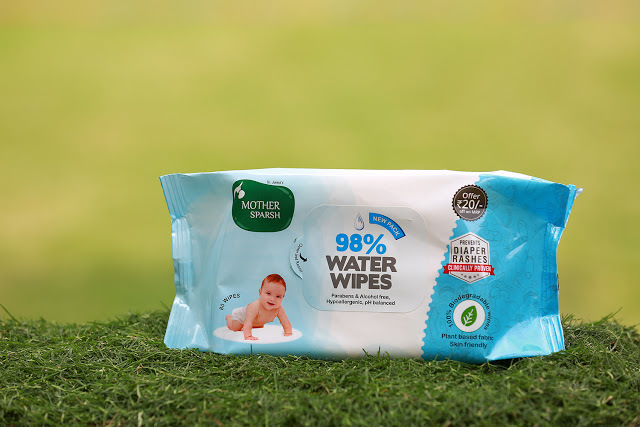 Frequent changes of nappy are required, I made sure I use the water-based Mother Sparsh wipes only as I know that the baby’s skin is 10 times more delicate than a grown-up. I don't have a master bedroom so The bathroom being outside the room was colder than our imagination. When any nappy change was required, I always cleaned using the polyester Free Baby Wipes. I always used to do it inside my bed room so that I don't need to take my baby outside in colder temperature to wash and change, I mostly kept her away from illness in both ways. By using the 100% water wipes, the cleanliness was assured as well as unnecessary exposure to the cold water / cold air was avoided. This is a real instance from a real mom’s life. So, I always used the polyester Free Baby Wipes so that the baby’s soft skin stayed rash free and clean. While taking care of the baby, a mother has to also look after the aspect of hygiene. Diapering is not always sufficient for the hygiene of the newborn. Every time a diaper is changed, babies experience vulnerability on their skin, dryness and sometimes even skin rashes if the area is not cleaned sufficiently. For avoiding any fungal or bacterial infection, cleaning is mandatory. But, water is not the easiest option and this is where wet wipes come very handy. Choosing a wipe must be made with utmost care as the baby skin is really very delicate. I started using cloth nappies which my mother in law has made using old ( washed and sanitized) bed sheet, cotton cloth etc. It was really very helpful and there was no chance of diaper rash at all, I have decided that I would use diapers only when I have to go out or when baby will sleep as I never ever wanted my child to be exposed to those harmful chemically made diapers or wipes. totally nature friendly. They are tested and hence proved safe for the baby’s skin. Mother Sparsh wipes are the purest wipes with extra moisture that provide a gentle Sparsh to baby which keeps baby comfortable, happy and smiling.